New Christmas Carrols; Being Fit Also to be Sung at Easter, Whitsontide, and other Festival Days in the Year. Newly Reprinted. (London: Printed by J. M. and are to be Sold by W. Thackeray, and T. Passinger). Note: Chappell, The Roxburghe Ballads, Vol. 7, p. 785, tell us that "J.M." is John Miller. Gods dear son without beginning. To the Tune of, Why weep ye, &c.
A Carrol for St. John's day. When Bloody Herod Reigned King - Davies Gilbert, Some Ancient Christmas Carols. Of Herod's Bloody Reign - William Sandys, 1833. Also found in A. H. Bullen, A Christmas Garland (London: John C. Nimmo, 1885), pp. 205-8. Also found in Joseph Ritson, Ancient Songs and Ballads From The Reign of King Henry the Second To The Revolution. 1790. W. Carew Hazlitt, ed., Third Edition. London: Reeves And Turner, 1877. Repr. Detroit, MI: Singing Tree Press, 1968, pp. 351-54 from From a collection intitled, "New Christmas Carrols: Being fit also to be sung at Easter, Whitsontide, and other Festival days in the year." no date. 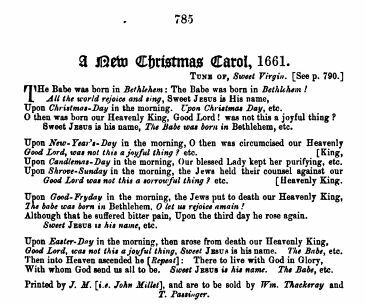 Also found in Edith Rickert, Ancient English Christmas Carols: 1400-1700 (London: Chatto & Windus, 1914), p. 249. A general Carrol for any time. Also found in William Chappell, The Roxburghe Ballads, Vol. 7, p. 785. God grant we may our lives amend: Amen. And grant us comfort in the end.